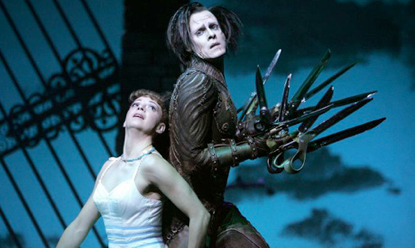 “Edward Scissorhands” was the fifth ballet by Matthew Bourne we’ve seen after his “Swan Lake” that got us hooked back in 2000, “The Car Man” also in 2000, “Nutcracker!” in 2003 and “Highland Fling” in 2005. I’d say now that “Scissorhands” was our second favourite of these five just after “Swan Lake”. What is so marvellous is how Bourne makes the story of the 1990 Tim Burton film is own. He gets to the heart of this modern fairy tale and presents it as the parable of the artist in society, an observer, permanently outside of it, who can communicate with it only through his works or art. Composer Terry Davies has created a soaring score from Danny Elfman’s themes for the film. Bourne gives the Inventor’s creation of Edward a backstory and changes the movie’s miscellaneous gaggle of mostly female neighbours into six regimented four-member families--wife, husband, son and daughter--to focus more attention on the theme of conformism in society. Women’s sexual attraction to Edward (Sam Archer)* is still there but focussed almost solely on Joyce Monroe (Michela Meazza), whom Bourne also makes the Mayor’s bit on the side. In terms of dance the subject sets Bourne the challenge of how to choreograph pas de deux for a character who cannot use his hands. This he accomplishes with panache in the climaxes to each of the two acts. Act 1 ends with Edward’s fantasy pas de deux with Kim (Kerry Biggin)*, with real hands able to lift and caress, while the two are accompanied by a topiary garden come to life. It’s beautiful, touching and joyful. Near the end of Act 2 is Edward’s second pas de deux with Kim, this time with his “scissorhands”. Here Bourne’s seemingly inexhaustible devises hold after hold between male and female that do not involve quite dangerous-looking hands. This, too, is beautiful, but conjures up an overwhelming sense of pathos. As in the film, the ballet is presented as an older Kim’s recollection of her youth. Unlike the film she has no child. Thus, at the end of Bourne’s version, both Edward and Kim are left alone and yearning. We felt a real lift in spirits to see such an imaginative work so wonderfully performed. This being a matinee, the audience included lots of schoolchildren, who applauded the cast, and especially Sam Archer as Edward, as if they were rock stars. We couldn’t help feeling that it’s a ballet like this, rather than so many stale “Nutcrackers”, that will really turn kids on to dance. *In the 2014-15 run, Dominic North and Liam Mower alternate as Edward and Ashley Shaw and Katy Lowenhoff alternate as Kim. Photo: Kerry Biggin and Sam Archer. ©2006 Tristram Kenton.